So, about a month or two ago, I went to see Chomsky speak at Concordia University with a vegetarian friend. Needless to say, his speech was very interesting, but left us with a hanger for more information, and also simple food. My friend suggested that we try out Cuisine Szechuan, a Chinese restaurant right next to the university. She is a big fan of spicy cuisine, and she knew she was in for a treat at this restaurant. 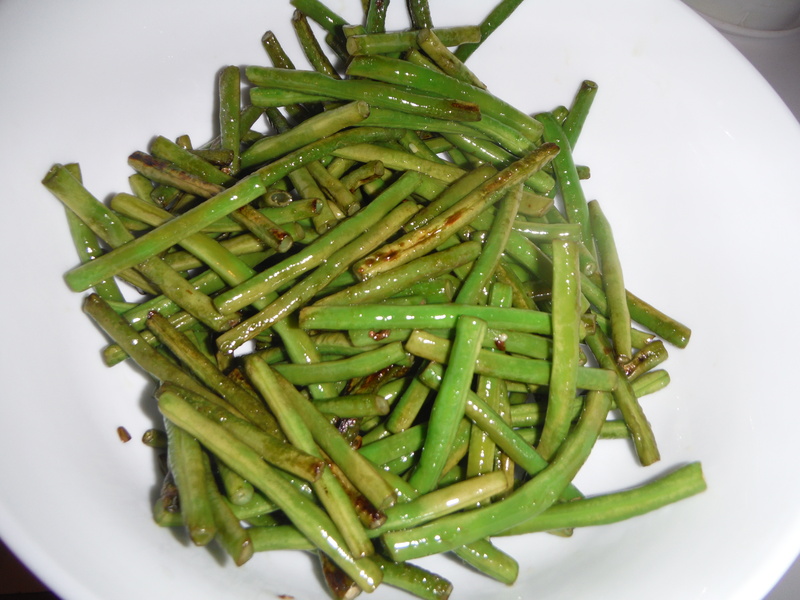 For the first time, we (he joined us for the food part) tasted Chinese green beans. Apparently this is a staple of Chinese buffets… well, we can totally see why: this dish is very tasty and delicious! We went to buy our green beans at the Asian grocery store and we found these Vietnamese gigantic green beans. They were delicious! 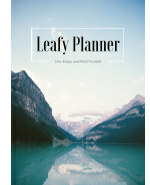 We had to give it a try, and here is what we came up with. We have to say, we are pretty proud of ourselves! 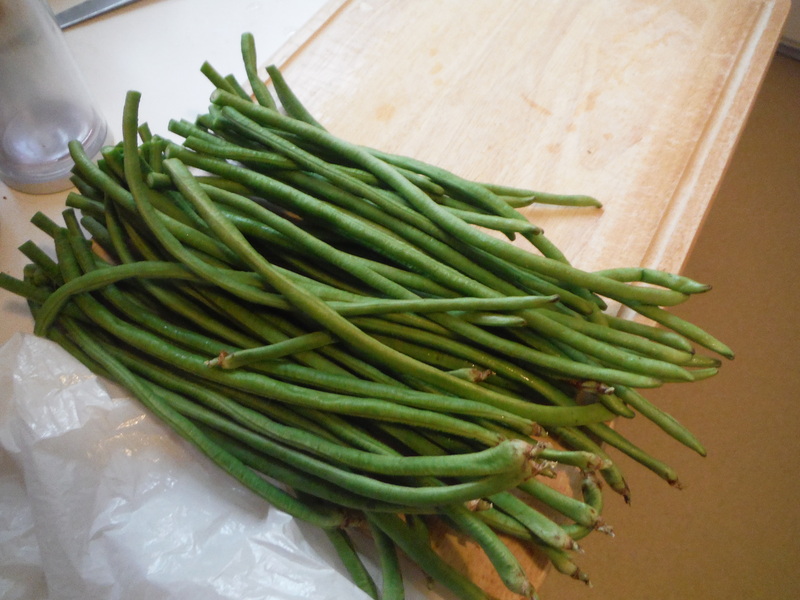 1) Cut out the extremities of the green beans and wash thoroughly. Drain well and cut into 2 inch pieces. 2) Heat a wok or sauce pan on medium heat and add 1 tbs of olive oil. 3) When the oil is hot, stir in the beans and stir fry until the skin starts to brown. You want the beans to stay crunchy, but still be cooked. This will take about 10-15 minutes. 3.5) While you wait for the beans to cook, mix all the sauce ingredients in a bowl. You want the sugar to dissolve into the sauce. Set aside. 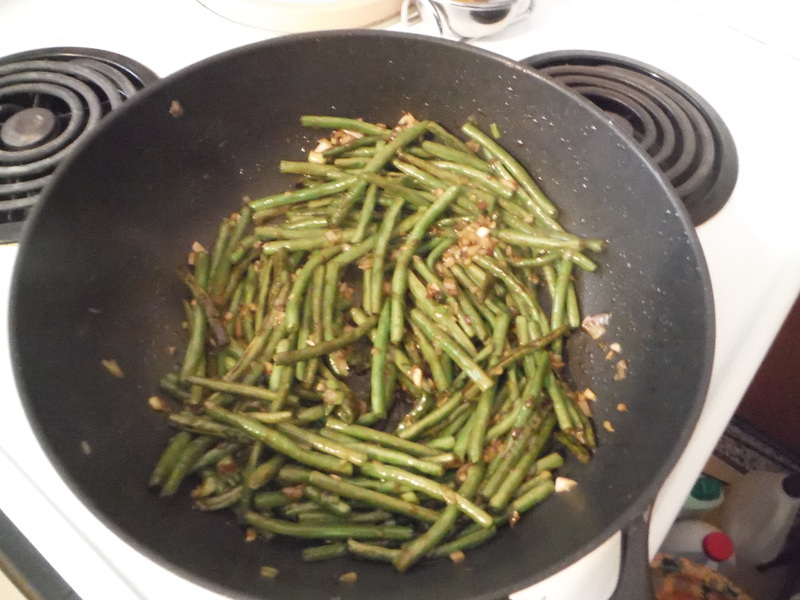 4) Once the beans are cooked, removed them from the wok and set aside. Your beans should look something like this once ready to step out of the wok. 5) In the same wok, put 1 tbs of olive oil, and let it heat up. 6) Add in the garlic, ginger and scallions. Stir until fragrant. 7) Add the sauce mixture and the chili paste and stir. 8) Add the beans and stir until they are evenly coated with the sauce. This recipe is great because it is spicy, without being too overwhelming. This is a perfect side dish. The beans stayed crunchy and delicious, while the ginger really give this a nice kick! For lunch, I ate these as my vegetables with some quinoa over the lentil soup (if you don’t put too much water it becomes this really delicious sauce that goes great with quinoa) I made the other day. Complete with an orange and a glass of soy milk, it was the best lunch I had this week!